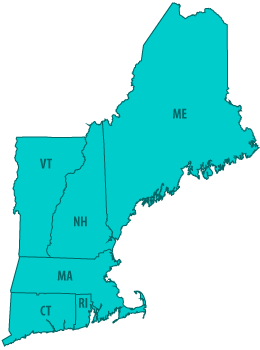 PESCO represents electrical industry manufacturers; covering territory throughout Connecticut, Maine, Massachusetts, New Hampshire, Rhode Island, and Vermont, plus Upstate New York (AZZ only), and New Jersey and New York State (PG Life Link only). We offer our clients the benefit of established, respected sales coverage for all of New England. Our location in North Andover, Massachusetts allows easy access to Boston-Logan, Manchester-Boston, TF Green, and Portland International airports. To contact the representative covering your area, please click here.